Escape the rush of the city and enjoy the relaxed comfort of Downtown LAs newest boutique hotel. Our swanky urban oasis provides travelers the ideal locale for work and play and is a refreshing recent addition to the Downtown hotel scene. The Luxe City Center Hotel is perfectly positioned steps from STAPLES Center and Microsoft Theater and just a few blocks from Downtowns Business District. Our 178 guestrooms including 16 suites are among the most spacious in the City blending smart refined decor with a residential feel. 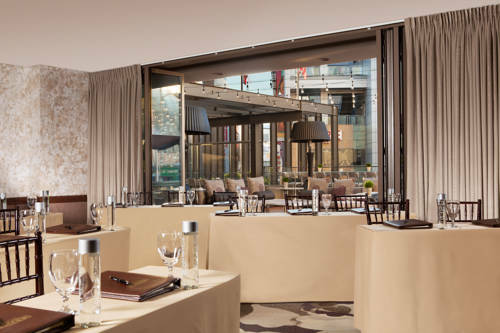 At the crossroads of business entertainment and sports the Luxe City Center Hotel is an optimal location for meetings and events. We offer more than 6000 square feet of flexible indoor-outdoor event and meeting space. The Luxe City Center Hotel is perfectly positioned steps from STAPLES Center and Microsoft Theater and just a few blocks from Downtowns Business District. Our 178 guestrooms including 16 suites are among the most spacious in the City blending smart refined decor with a residential feel.